When it comes to entertainment there is no doubt that Filipinos can do the job well. Apart from singing which is becoming the first thing other people think when talking about us, Pinoys are also a force to be reckoned with in dancing. 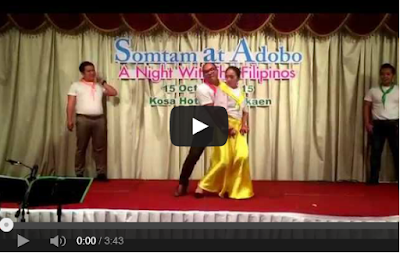 Here’s a proof of the dancing prowess of Filipino leaders in Phitsanulok during the 1st Filipino Community Leaders’ Congress held at Kosa Hotel in Khon Kaen on October 15, 2015. Not only was it entertaining, it also received the loudest applause of the night. Enjoy!